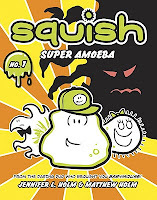 Squish: Super Amoeba by Jennifer L. Holm & Matthew Holm. (Grades 2-5.) Random House Books for Young Readers, May 2011. 96 pages. Reviewed from ARC provided by publisher. Meet Squish, grade school amoeba. He's just dealing with what all amoebas have to deal with: friends that mooch his lunch money, boring science class, detention, and a bully threatening to EAT his friends if he doesn't let him cheat off him on the next science test. What's an amoeba to do? As Squish imagines himself as his favorite comic book hero, he just might figure out what it'll take to save the day! Y'all know that I'm a huge Babymouse fan and I was so excited to see that Jenni Holm and Matt Holm are starting a new series that's, well, not quite so pink. :) I'm happy to report that Squish: Super Amoeba doesn't disappoint. Take the stuff you love about Babymouse: humor, a relateable protagonist dealing with realistic situations, and wild flights of imaginative fancy. Color 'em green (not pink!) and add a smattering of facts about microscopic life and you have Squish. Seriously, the series takes successful elements from Babymouse and repackages them in an original story in a way that's appealing to boys. It's not just the different colors that gives it guy appeal, either. There's a definite gross-out factor when you're talking about amoebas, paramecia, and flatworms. Matt Holm strikes a really nice balance with the artwork here. It's gross enough to appeal to kids who like that sort of thing, but not so gross as to turn other kids off. And for a blob, Squish is remarkably expressive. I have a soft spot in my heart for Babymouse with her cute pink bow and her love of cupcakes, but then I'm a girl. And I'm happy to have something similar to hand to the boys (and girls!) who turn tail at the first sight of a pink cover. Squish: Super Amoeba will be on shelves May 24!